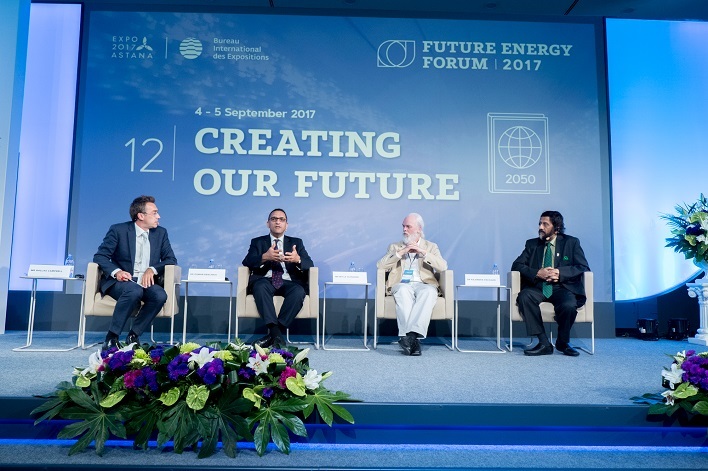 On 4-5 September 2017 the final 12th conference “Creating our Future” of the Astana EXPO-2017 Future Energy Forum took place in Astana, Kazakhstan. UNESCO has also participated and contributed to the conduction of the forum. The Future Energy Forum is a series of thematic conferences, organized in the framework of the EXPO-2017 in Astana and designed to inform, inspire and innovate, to foster participation and exchange, and to actively create a global platform for a global future of renewable energy. Attendees of the forum included high-level government representatives, international agencies, leading scientists and academics, NGOs, representatives from industry and engineering, and other key players and stakeholders in the energy sector. The 12th and final conference entitled “Creating our Future” took place on 4-5 September. Nobel laureates, leading experts of science and industry – the world’s energy community – assembled to accumulate and exemplify the ideas, knowledge, and solutions presented and developed throughout all 12 conferences of the forum. Besides expert plenary sessions, keynotes, and workshops made up of top-class experts, in addition five working sessions were organized throughout the two conference days, to which UNESCO has also contributed. On 4 September UNESCO Representative for EXPO, Mr Osman Benchikh, delivered a keynote on “Harnessing the Role of Science and Education in Sustainable Energies” and participated in the moderated expert plenary session “Shaping the Future of Energy”. On 5 September, second conference day, UNESCO Almaty Office in cooperation with UN Women organized a panel session on «Women and girls provide key solutions to energy challenges» with the participation of the International Sustainable Energy Development Centre, Category 2 (ISEDC), based in Moscow, UN Environment and other partners from government, academia and private sector. The event provided a platform for discussing existing challenges and opportunities for female practitioners in the energy sector. It also contributed to forge new connections and enhance the participants’ knowledge of the issues women face in the energy industry, as well as to encourage women and girls to pursue their careers in this field. The meeting was widely attended by youth, thus allowing to discuss more in depth on how to pursue girls and young women careers in the energy sector through proper education, training, advocacy and networking. Concluding the Future Energy Forum, validating its principles and underlying foundations, was the preview of the Astana EXPO-2017 Manifesto of Values and Principles “’Building the Future. Saving the Planet”. The Manifesto represents the culminated knowledge – solutions, innovations and frameworks – gathered throughout the twelve conferences of the forum. It serves as a legacy of the event, but more importantly as a blueprint for the international energy transition. UNESCO provided its input to the draft of the Manifesto, highlighting the importance of promoting scientific knowledge, education and capacity development for its inclusion into the final version of the Manifesto. The document is being prepared by the FEF Steering Committee, and will be further presented to the president of the Republic of Kazakhstan. The above activities contributed to the SDG 5 on gender equality and empowerment of women and to the SDG 7 on the access to sustainable energy for all.